Yamaha Factory Racing riders V. Rossi and C. Edwards started their final pre-season preparations today as the Official MotoGP Test began in Jerez. The Andalusian circuit, which will play host to the second round of the MotoGP World Championship in March, will provide the teams with the last chance to fine-tune their 800cc MotoGP motorcycles before the season gets started in Qatar. After three consecutive races in warmer climes, it was a wet return to European shores this morning when the MotoGP paddock was subjected to a heavy rainstorm and as a result Rossi and Edwards were not able get out on track until the early afternoon. However even after that the low temperatures meant that track failed to dry properly and it remained quite damp in places, causing the Yamaha pair to take it gently throughout the afternoon as they concentrated on trying to find the right set-up ahead of a hopefully drier day tomorrow. The timesheets were topped today by Honda rider Marco Melandri, who set a time of 1'42.563, a full two seconds off Rossi's old 990cc lap record, which still stands from 2005. Edwards came in at 11th position with best lap of 1'43.845 with Rossi behind him in 13th after a lap of 1'44.494. "Actually that was a really useful day for us, despite the weather! Obviously the times don't really show it, but I'm not worried about those because the conditions really limited what we could do with regards to going fast. It wasn't nice out there with the patchy conditions and it was really quite dangerous; it was obvious that whoever took the most risks was going to be fastest today! Anyway, we came here with our 壮mooth-track' setting which worked so well in Qatar and tried it here, which is much bumpier." "The good thing about today is that we think we now understand why it doesn't work so well on bumpy tracks and so tomorrow we're going to work on changing that and getting it to work everywhere. That's the aim for tomorrow and hopefully we'll be successful in that task, which will put us in much better stead as far as adjusting the bike to different tracks goes. We were obviously nowhere near our times from December today but we know the bike is better than it was then so I am sure that once the track dries out properly and it gets a bit warmer, we'll get a lot faster." "The most important thing about this test for us is that it gives us the chance to see how our new bike has changed from the test here in December to now. We've had three tests in between and the bike has changed quite a bit, plus we've had some new parts for the engine and the bike is a bit faster. Today wasn't great because the conditions were bad, it didn't really dry out all day so it wasn't possible to go so fast. Anyway though, I am impressed at some of the times of my rivals in these conditions! 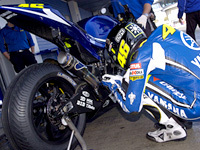 I was quite fast at the start when it was quite wet, but really it wasn't enough to do a real wet-weather test." "So after today we still can't see how much we've improved from the last test, but hopefully tomorrow will be better. We've found some interesting things though and I think it will be better tomorrow. Of course the objective of this weekend is to be ready for the race when we return here and I hope we will also be able to go faster than we did here in December. The biggest changes since we were here last have been made to the suspension, especially in the front, but today we couldn't really see the potential of these changes. If it becomes warmer we will also try to find some good tyres for this track, so let's hope for sunshine!" "Today was a bit disappointing because we obviously have a lot of work to get through here and the weather really delayed us, but anyway both riders found out some interesting things about their bikes in these conditions and gathered some good information. We hope that the weather will be better tomorrow so we will be able to see how much our bike has improved since the last test here. It's a bit cold at this time of year, but hopefully the sun will come out and we will be able to really get started!"